Whenever possible, I try to go to my local indie bookstore Skylight Books. No matter, where you are you may have more options than you think. Here’s an indie bookstore finder you may find useful. You may also be able to use this link to set up or attend local readings. Thanks, John F. Buckley, for bringing this to my attention. In August, we climb into a time machine for a look at bugs in medieval manuscripts, a man punished for a novel set 900 years in the future, and how lessons from labor movements can help improve the lives of adjuncts and the future of universities. Please enjoy the journey. In Dorchester County, Maryland, a teacher was taken in for an “emergency medical evaluation,” suspended from his job, and barred from setting foot on another public school. The crime? The teacher wrote two ebooks under a pen name set 900 years in the future, where a school is attacked in a terrorist act. Jeffrey Goldberg in The Atlantic compared the incident to a Soviet-style punishment from the Dept. of Insane and Dangerous Overreactions to Fictional Threats. The accused, Patrick McLaw, was awarded teacher of the year in part for helping one of his students self-publish an ebook. Perhaps publishing books on Amazon truly is evil. 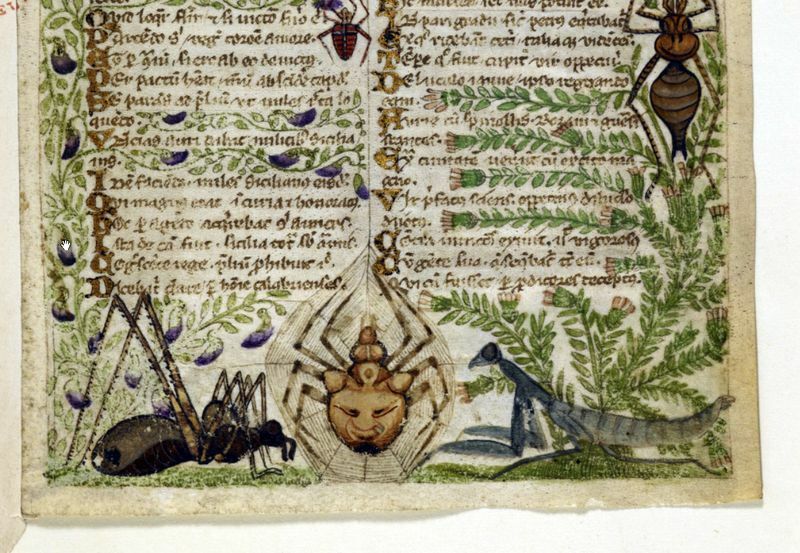 Sarah J. Biggs, in the British Library Medieval Manuscript Blog, provides us with examples of bugs in various medieval texts often put in the margins of books for decorative reasons. Apparently, not very many texts provided illustrations of insects, and the ones that did often used them for humorous reasons. The next time someone asks me whether they should attend a creative writing program, I’ll send them this article from Nick Ripatrazone at The Millions, where he breaks down the responsibilities of teachers – and students – when attending MFA programs. The business of creative writing needs to stop being a dirty subject when far too many students are struggling with huge debts, unrealistic hopes, and false expectations. The subject of adjuncts living in poverty won’t go away, in real life or in this blog, because of how American universities have chosen hiring administrators and building amenities over investing in faculty. Elizabeth Segran writes a compelling article in the Atlantic about whether a budding labor movement can improve the lives of non-tenured faculty in universities. My parents always encouraged me to read anything and everything. If you feel the same way, please meet Phyllis Rose, an avid fiction reader who decided to tackle an entire shelf of fiction (from LEQ to LES) in the New York Society Library. And what was the outcome? A book, of course. Rachel Cooke, in the Guardian, provides us with the story behind Phyllis Rose’s book The Shelf: Adventures in Extreme Reading. Perhaps this will turn around the trend of people reading less books.